A majority of Georgia Tech students, typically known as Type A students, are achievement-oriented, ambitious, and competitive. The heavy workload at Tech, together with students' high standards for themselves, leads to a high level of stress and mental health issues. 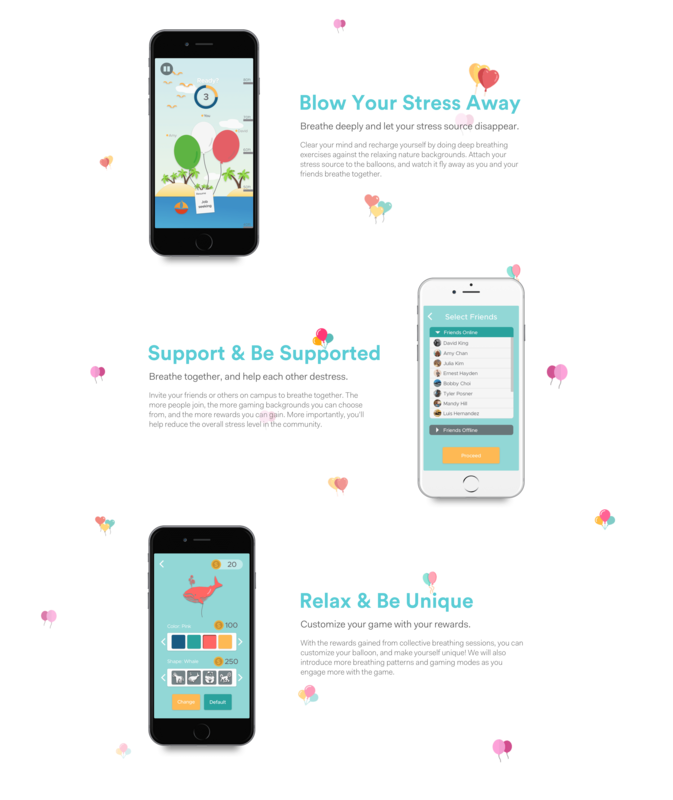 We designed a collective breathing game application that encourages students to do deep breathing exercises together in order to relieve their stress. 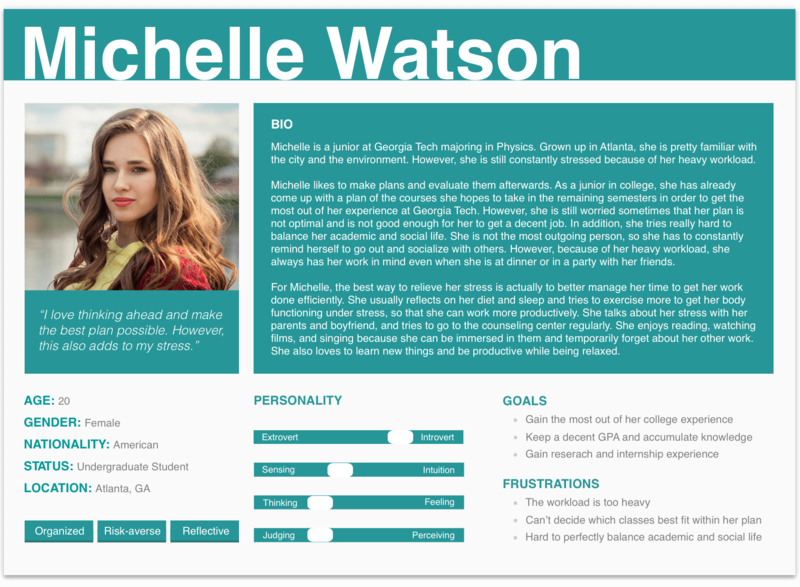 During the research phase, I was in charge of interviewing potential users and creating personas using Sketch. I also contributed to the literature review and competitive analysis. After our brainstorming session, I created low-fidelity prototypes of the collective breathing dark-room concept, and moderated user feedback sessions. I then designed the user interface for the onboarding process and the tutorial of the app using Sketch, and created the game animation using Principle. During the evaluation phase, I moderated several usability testing sessions, and was in charge of analyzing & synthesizing the data we collected and deriving design recommendations from them. We started with a vague idea of designing an intervention to help relieve Georgia Tech's students' stress. After our interview with mental health experts on campus, we narrowed our idea down to creating a collective breathing intervention for stress relief. To get an overview of Georgia Tech's students' stress level and the current intervention methods, we conducted a semi-structured interview with a mental health expert at Georgia Tech's counseling center. Having worked in the counseling center for over 20 years, our expert deeply understands where the student stress comes from, and has tried various ways to help improve students' mental health state on campus. Since community-based peer support and simple relaxation techniques are proven to be effective, we hope to use technology to promote them so that more students have easy access to resources for stress relief. After another unstructured interview with a Professor in Health Informatics, we decided to focus on creating a collective breathing intervention to encourage students to do deep breathing exercises together in the community. The research literature has consistently shown that deep breathing is a simple but effective way to relieve one's stress. Our idea is to not only encourage students to do breathing exercises, but also let them support each other throughout the process. 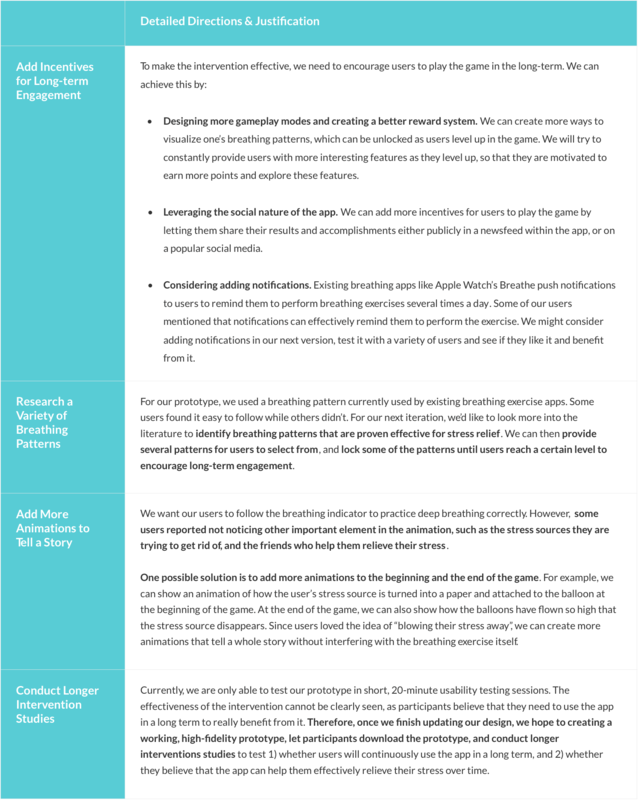 We first conducted a competitive analysis of existing individual breathing exercises and games on various platforms. Effective audio/visual/haptic breathing cues are important for breathing apps. Creating immersive experiences for users might lead to extra calming effect. Users need appropriate & positive feedback on their breathing performance in order to learn the breathing techniques. A variety of sensors are available to measure users' breaths/stress level. To our knowledge, there is no existing community-based breathing exercise available. To get more inspirations on designing community-based interventions, we conducted another competitive analysis focusing on community-based health interventions. 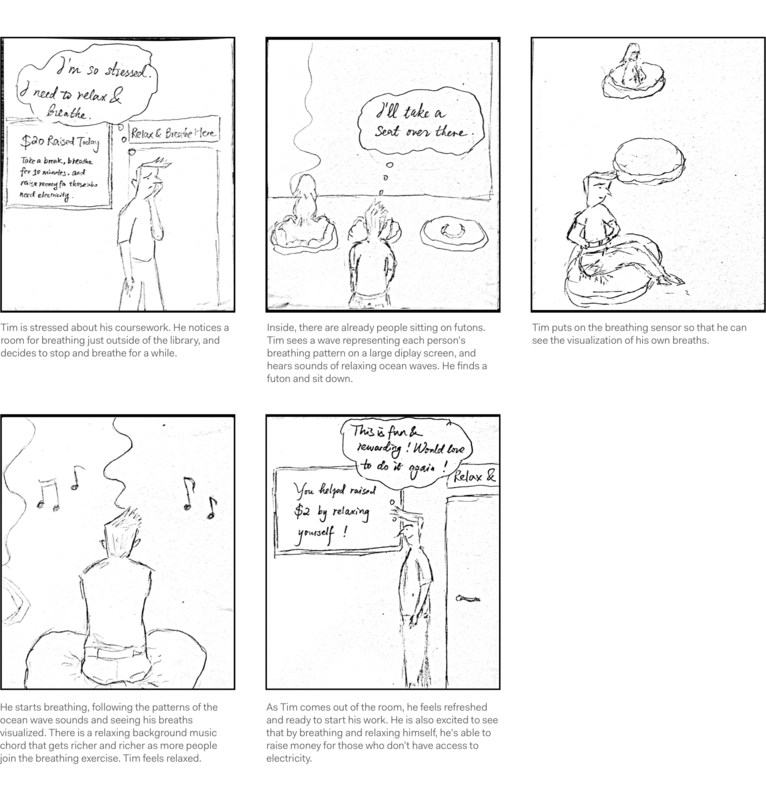 The auditory components of Pulse of the City and Yog create a sense of connectedness; we could possibly incorporate audio into our design as well. There are different approaches to designing a community experience. Existing solutions have used anonymous peer to peer network, public art installations, existing social network, etc. Our team should consider multiple strategies in the ideation phase, and narrow them down based on what is suitable for our specific purpose, as well as feedback we get from our users. We looked into studies that focus on designing technologies that encourage people to practice breathing techniques. The literature review helps us find various ways of measuring people's breathing patterns and presenting feedback to them. School work and social life are the main sources of stress for most students. Most participants have heard of mindfulness and breathing exercises. However, none of them perform these activities regularly as a method for stress intervention. 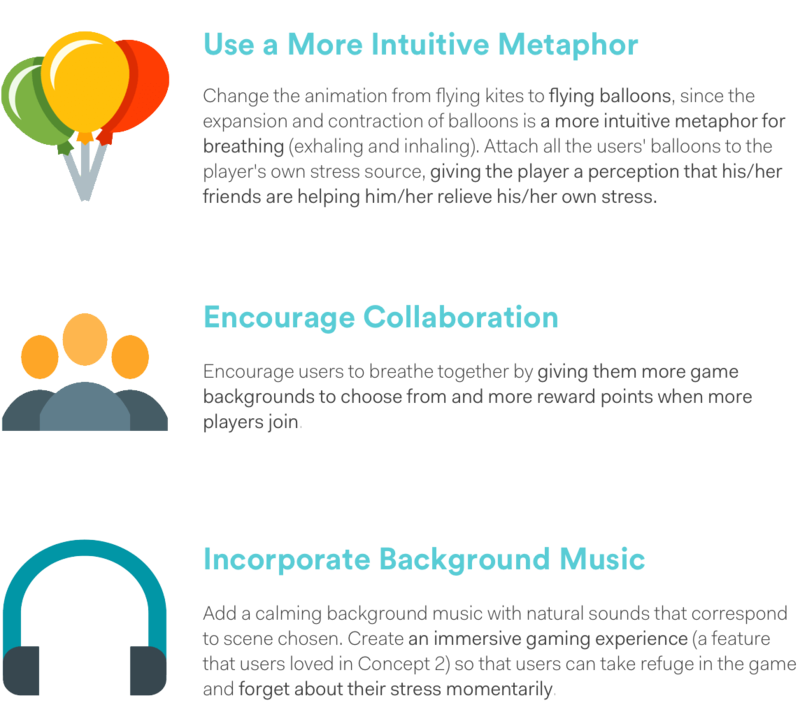 Immersive experience, whether it’s playing competitive video games, reading, or listening to music, helps students forget about their stress and concentrate on what they enjoy at the moment. 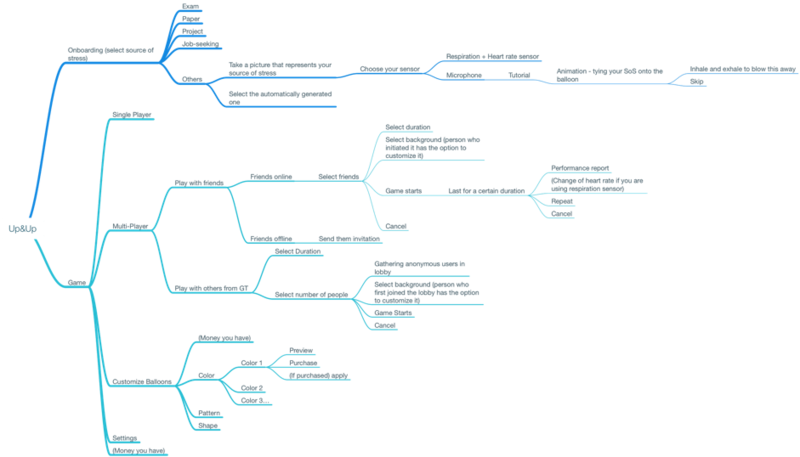 Our findings motivated us to design breathing interventions that are immersive and easy to learn. It also confirmed that motivating students to do breathing exercises together can be one effective way to relieve their stress, because most students have heard about breathing exercise and have positive associations with it. After summarizing and analyzing the interview results with my teammates, I took the lead to create the following personas to help us guide our design. As a group, we conducted a design-studio-style workshop to brainstorm potential solutions. Group members were given two 10-minute sessions to sketch out as many ideas as possible. We then each presented our ideas, grouped similar ideas on the whiteboard, and offered critique to each other's ideas. 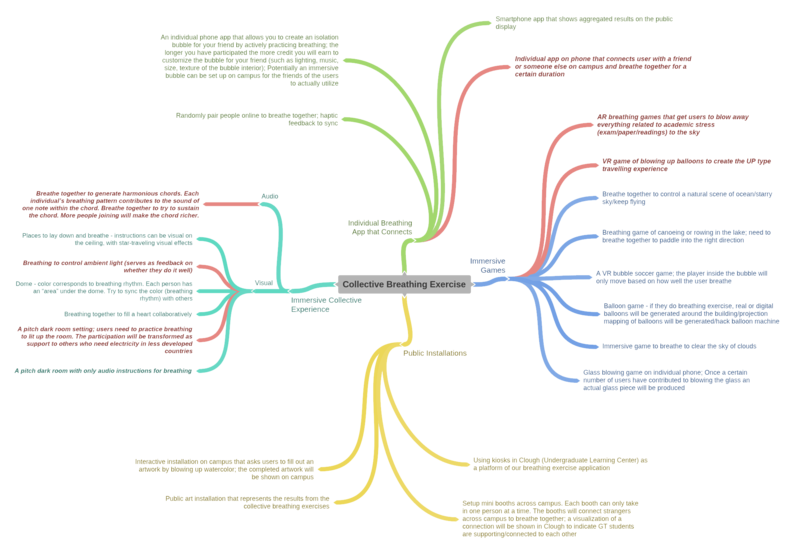 Here's a summary of the ideas generated. Ideas that are selected and combined into our final concepts are marked in red. 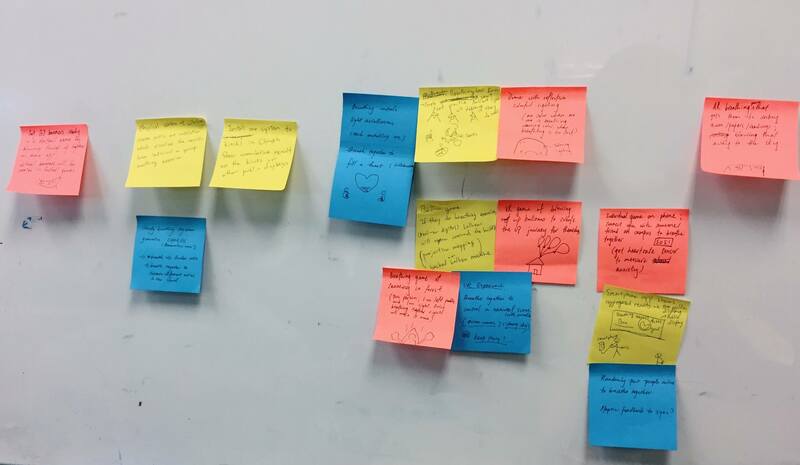 We then came up with low-fidelity prototypes for our top three concepts. Concept 1 is a collective breathing exercise app that enables users to breathe with their friends or other students on campus. The purpose of this app is to teach users breathing techniques which can help relieve their stress, and to enhance a sense of togetherness by letting them breathe in similar rates/patterns with others. For this idea, users may be able to choose a belt type sensor or a microphone to measure their breathing patterns (in their smartphones). 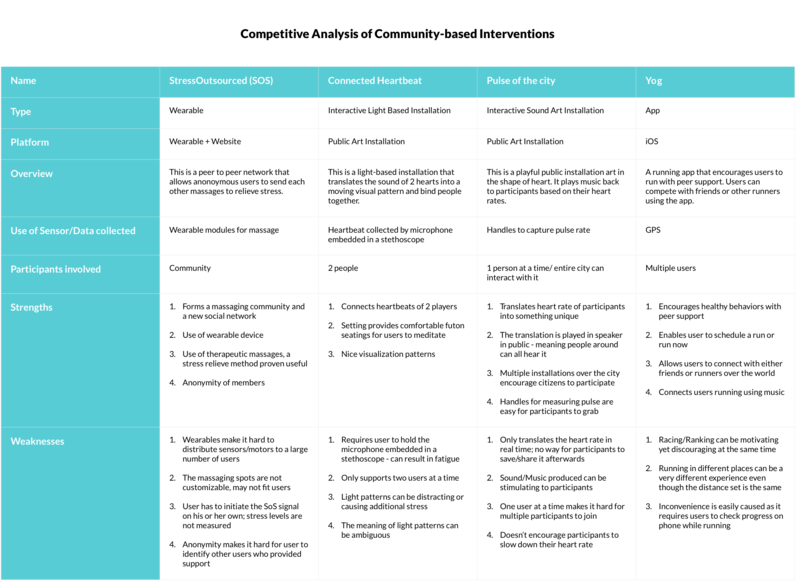 Click to view the low-fidelity interactive wireframe. This is a collective, immersive experience that aims to let people (20 max) breathe together in a relaxing environment. Students are able to enter a pitch dark room and sit on futons, which have pressure sensors and can recognize when a student is sitting on it. After students put on their breathing sensor (belt) around their torso, they will be able to see their breaths visualized in wave form on a large display screen, which is mostly dark except for the breathing patterns. Students will hear relaxing sounds of ocean waves that serve as an audio cue to let them know when they should inhale and exhale. In addition, there will hear a soothing background music, which is composed of a progression of simple music chords. The chords will become richer and richer as more people sit down and start to breathe; each person will contribute to part of the chord, so that the experience becomes even more immersive and relaxing as more people join. In addition, we also hope to make this experience part of a fundraising process. We will let students know that when they breathe inside, they will be able to raise money for those in need of electricity. When they come out, they can see what they’ve contributed by breathing and relaxing themselves, which will motivate them to return and breathe more in the future. Our third concept is a mobile breathing game. Users are able to turn their sources of stress into a kite, and then breathe to fly the kite and "blow their stress away." They can play the game with friends they know, or anonymous players on campus, using either a belt sensor or a microphone as input. After successfully completing each breathing session, users are rewarded with points based on their breathing quality, and can use the points to customize their kites. 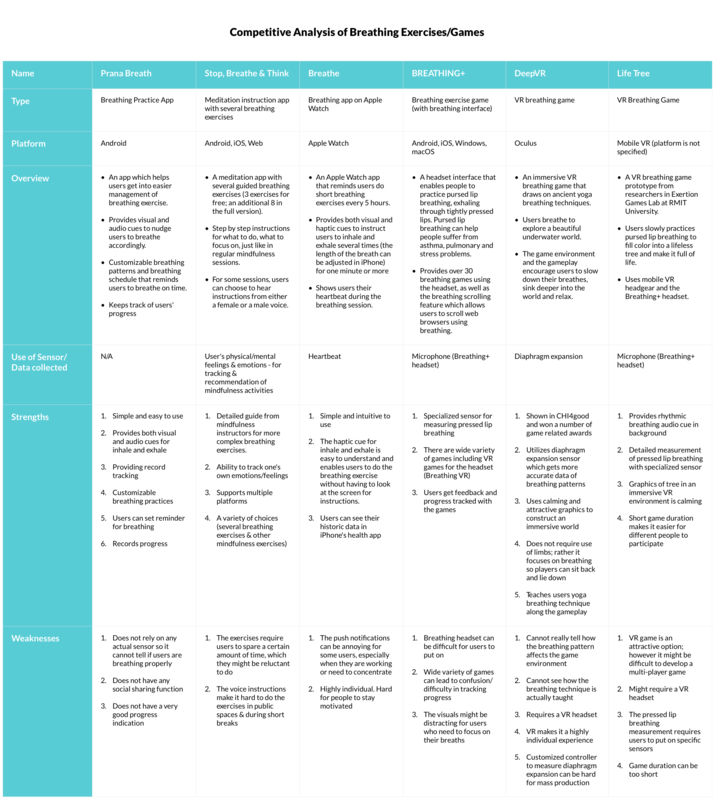 Click to view the low-fidelity interactive wireframe. We presented our 3 ideas to potential users at Georgia Tech and gathered both qualitative and quantitative feedback. For Concept 1 and 3, we let users interact with our interactive wireframes; for Concept 2, we walked users through our storyboard, played them a sample background music , and presented them with a sample visualization video so that they can get a feel of the immersive environment (we let them know that we will create our own visualization with similar colors but more relaxing patterns if we choose concept 2 as our final concept). Users were encouraged to think aloud during the process. After presenting each idea, we asked users to rate how frequently they'd use the solution, how effective they think it would be, and how likely they would recommend the solution to a friend. We also asked their favorite/least favorite part of each solution, and let them compare the three solutions. We created an affinity diagram based on the qualitative results we got. Users unanimously preferred Concept 2 and 3 over Concept 1. 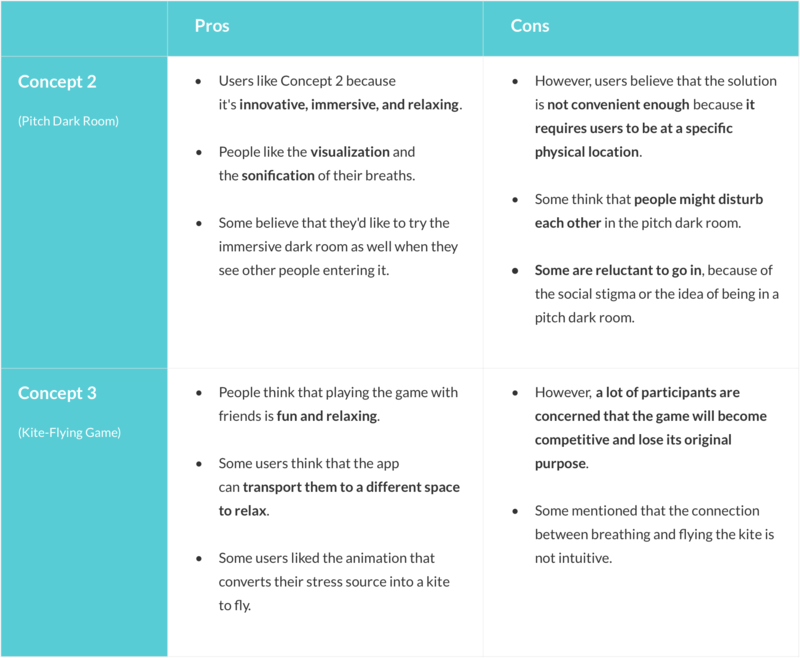 Some mentioned that Concept 1 is similar to Concept 3, but the latter is more engaging because of the gamification factor. Therefore, we focused our analysis on comparing Concept 2 and Concept 3. The user feedback is summarized below. Almost every student owns a smartphone. Having an app on one's phone makes it more convenient to perform breathing exercises when needed. The breathing visualization in the game is more concrete than in the pitch-dark room. Prototyping and creating a mobile app is more feasible and less expensive, but equally effective based on user feedback; if we created one or several dark rooms for breathing intervention, GT has to provide the space for us. The game involves an initial setup process, which creates a personalized experience for users to select a specific source of stress and a sensor to measure the input. After going through a simple tutorial, users will be able to select the gameplay mode to play with either peer support or just by themselves. We then provide options for users to play with either friends they are familiar with or others from the same school. In order to encourage users to use the multiplayer mode and gain peer support, we provide more customization options for the background of the breathing scene when more players are involved in the game. Then, users can immerse themselves in the game, with a nice nature background illustration and relaxing nature sound in the background. At the end of the game, the users will be rewarded based on how well the group did together. Finally, they can use the reward to customize their own balloons, an incentive designed to promote a prolonged engagement. Task 1: Select job-seeking as source of stress and microphone as your sensor. Then complete the tutorial. Task 2: Find other players who might be interested in playing the game with you. Task 3: Play the game and user your reward. 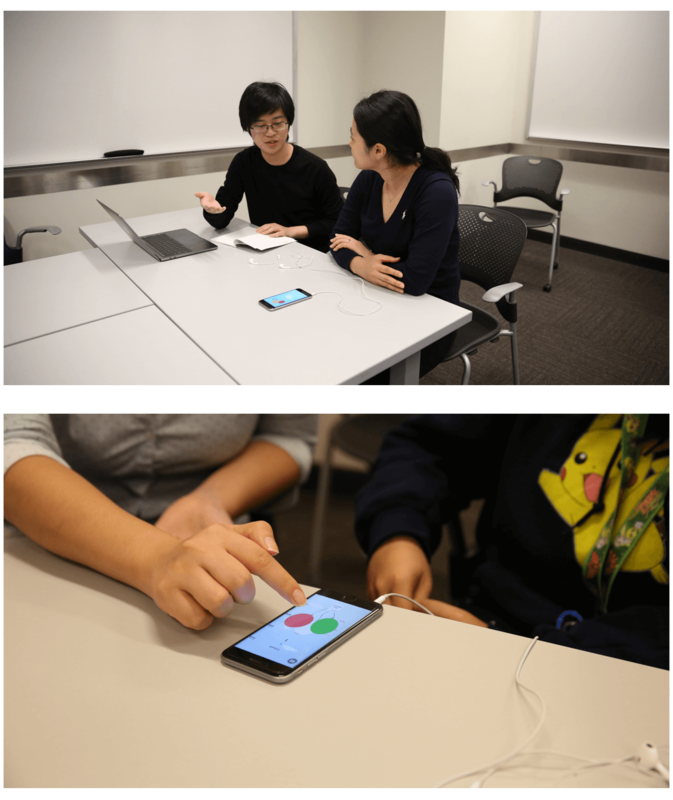 We then asked them about their experiences playing the game, how frequently they would use the solution once it's refined, how effective they think the solution is, and whether they'd like to recommend the app to their friends. 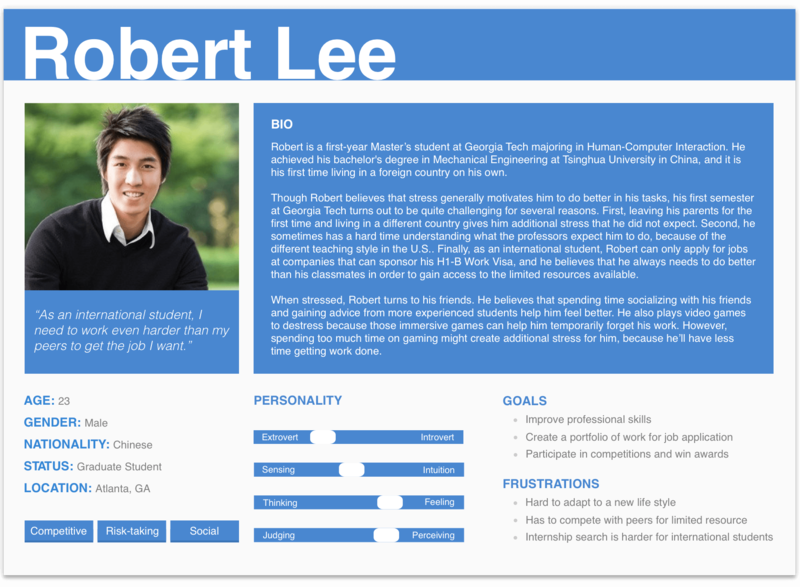 We also let them comment on their favorite/least favorite parts of the design, and complete the System Usability Scale (SUS). It's a fun and intuitive way to teach people deep breathing techniques. The game design is visually attractive. The background music is soothing and can disconnect users from the outside world so that they can focus on their breaths. It encourages users to support each other in stress relief. Users need more incentives to continuously engage with the app and get maximum benefits from it. Some users want more modes of gameplay. The 3s-9s (inhale-exhale) breathing pattern was intuitive for some users, but not others. Users typically focus their attention on the breathing indicator, not noticing the stress source they are trying to get rid of, or other people who are helping them relieve their stress. The app can only temporarily relieve people's stress and put them in a better mood; it cannot and should not aim to help people really get rid of their stress source.